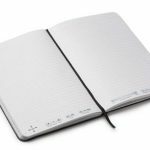 Livescribe is a tool I’ve been using for a year or so now within the UX team here at Caplin, to capture notes from design meetings and ongoing UCD contextual inquiries. It’s a great tool and is also discreet – useful in contextual scenarios where setting up a video recorder would be too intrusive. 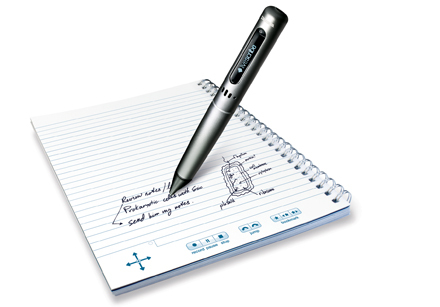 The Pulse Smartpen together with special dot paper and the Livescribe desktop software form the Livescribe system. 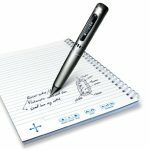 The pen has an small microphone and records audio that is synced up to the writing and a OLED display showing messages/status. The pen has a few party tricks up it’s sleeve: you can draw out piano keys and then click the pen on the keys to ‘play’; you can write out maths problems and the pen will provide the answer; you can also write a word and then translate it, the translation appears on the pen’s OLED display. Other ‘applications’ can be downloaded from the Livescribe app store. The special paper used with the Smartpen is covered in microdots a ‘digital paper technology’ created a few years ago by Anoto. As you write, the microdots are read by an infrared sensor in the pen, pinpointing it’s position, this enables the magic bit (for me): the live ink playback. 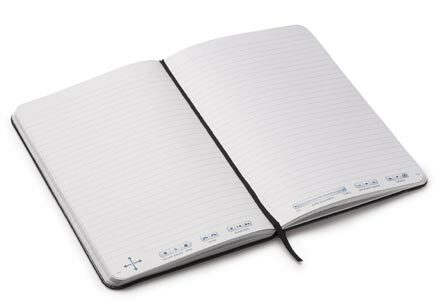 If you have a good quality printer you can print your own dot paper from the Livescribe desktop software (so you’re not tied into having to buy the paper pads) although the nice little Moleskine-esque notebooks are rather nice! This software works OK ’stand-alone’ playing back pencast sessions, but the interface for uploading/sharing the pencasts is (I have found) problematic. A clever feature of the software is that you can search your written notes, so for example searching Adobe will highlight ‘Adobe’ within your handwritten notes. It would be great to have the ability to export the pencast as a stand-alone file, hopefully this will come in later versions of the software (as currently recordings have to be uploaded to the Livescribe community website for sharing). When using the Livescribe for ‘real-time notetaking’ one thing I noticed is that it’s amazing how you think you are listening but then realise you have drifted off thinking about or another project, an email that needs to be sent or lunch and have missed some important point, fortunately with Livescribe you haven’t missed it as the pen captures everything that is spoken – it’s just that your written notes will have skipped a beat. Also I find it’s easy to slip into writing down what is being spoken, this obviously isn’t needed as you have a recording of it. To keep my note-taking inline with what’s being said I have adopted a bastardised version of the Cornell method. I use keywords supported with my interpretation/summary of what has been said. I use this when a significant artefact is encountered. This is useful for recalling in later interpretation sessions or when creating a consolidated artefact. Livescribe has it’s own bookmarking system (I haven’t fully investigated this yet) but I use a star as a marker to indicate a useful soundbite that could be extracted/quoted later. I still have a way to go refining my Livescribe notetaking technique, and I haven’t tried the transcribing software yet for tranfsorming written notes into editable text. When Livescribe iron out the problems I have experienced with the desktop software I would use this as my default note taking tool for all my writing, until then it will remain a very useful addition to the rest of my UX toolset. Previous Previous post: An agile team-board layout that works for us, for now.